Makita XT706 18V LXT Lithium-Ion Cordless 7-Pc. 1x Makita XPH01Z 18V LXT Lithium-Ion Cordless 1/2 Hammer Driver-Drill. 1x Makita XDT11Z 18V LXT Lithium-Ion Cordless Impact Driver. 1x Makita XSS02Z 18V LXT Lithium-Ion Cordless 6-1/2 Circular Saw. 1x Makita XRJ04Z 18V LXT Lithium-Ion Cordless Recipro Saw. 1x Makita XAG04Z 18V LXT Brushless 4-1/2" / 5" Cut-Off/Angle Grinder. 1x Makita DUB182Z 18V LXT Cordless Blower. 1x Makita DML185 18V LXT Lithium-Ion Xenon Flashlight. 2x Makita BL1830 18V LXT Lithium-Ion 3.0Ah Battery. 1x Makita DC18RC 18V LXT Lithium-Ion Rapid Optimum Charger. 1x Makita 831269-3 Tool Bag w/Wheels. The Makita 18V LXT Lithium-Ion Cordless 7-Piece Combo Kit is built for the pro-user who demands a wide range of best-in-class cordless solutions. The XT706 delivers 7 Lithium-Ion cordless solutions for drilling, driving, fastening, cutting, grinding, demolition, clean-ups, and more. The XT706 includes a 1/2 hammer driver-drill with 480 in. Of Max Torque, a powerful impact driver with a full 1,460 in. Of Max Torque, and a 6-1/2" circular saw with 2-1/4" cutting capacity. The kit also includes a recipro saw with a refined crank mechanism that delivers faster blade speed and longer stroke length for more efficient cutting, and a 4-1/2 angle grinder with an efficient brushless motor for corded grinding performance without the cord. Additional solutions include a cordless blower with a full 179 MPH of air velocity, and a rechargeable flashlight with a high-illumination Xenon bulb. The XT706 includes two 18V LXT Lithium-Ion 3.0Ah batteries, an efficient Rapid Optimum Charger, and tool bag. It's part of Makita's expanding 18V Lithium-Ion system, the world's largest cordless tool system powered by 18V Lithium-Ion slide-style batteries. For increased versatility, the tool can also be powered by Makita 18V LXT and Compact Lithium-Ion batteries with the star symbol on the battery indicating Star Protection inside. Variable 2-speed 1/2 Hammer Driver-Drill (0-600 & 0-1,900 RPM) with Makita-built 4-pole motor delivers 480 in. Of Max Torque; weighs only 3.9 lbs. Variable speed Impact Driver (0-2,900 RPM & 0-3,500 IPM) provides 1,460 in. Of Max torque for a wide range of fastening applications. 6-1/2 Circular Saw delivers 3,700 RPM for faster cutting and ripping through wood and weighs only 7.3 lbs. Recipro Saw provides 0-2,800 SPM and features "tool less" blade change; weighs only 8.3 lbs. 4-1/2" / 5" Cut-Off/ Angle Grinder delivers 8,500 RPM; features Automatic Speed Change technology that adjusts speed and torque during operation for optimum performance. Variable speed blower (0-18,000 RPM) for optimum speed control. 4-position flashlight with Xenon bulb runs up to 4 hours per charge. Rapid Optimum Charger communicates with the battery's built-in chip throughout the charging process to optimize battery life by actively controlling current, voltage and temperature. Type: Cordless Tool Combo Kit. Makita XPH01Z 18V LXT Lithium-Ion Cordless 1/2 Hammer Driver-Drill. 2 spd: 0 - 400 / 0 - 1,500 RPM. Blows Per Minute (2 speed): 0 - 6,000 / 0 - 22,500 BPM. Battery Charge Time (minutes): 30. Makita XDT11Z 18V LXT Lithium-Ion Cordless Impact Driver. No Load Speed (variable speed): 0 - 2,900 RPM. Impacts Per Minute (variable speed): 0 - 3,500 IPM. Net Weight (with battery): 2.8 lbs. Makita XSS02Z 18V LXT Lithium-Ion Cordless 6-1/2 Circular Saw. No Load Speed: 3,700 RPM. Net Weight (with battery): 7.3 lbs. Makita XRJ04Z 18V LXT Lithium-Ion Cordless Recipro Saw. Cutting Capacity (wood w/ 12" blade): 10". Strokes Per Minute (variable speed): 0 - 2,800 SPM. Net Weight (with battery): 8.3 lbs. Variable speed control dial: No. Makita XAG04Z 18V LXT Brushless 4-1/2" / 5" Cut-Off/Angle Grinder. No Load Speed: 8,500 RPM. Spindle Thread: 5/8 - 11 UNC. Net Weight (with battery): 5.8 lbs. Makita DUB182Z 18V LXT Cordless Blower. No Load Speed (variable speed): 0 - 18,000 RPM. Net Weight (with battery): 3.9 lbs. Makita DML185 18V LXT Lithium-Ion Xenon Flashlight. Net Weight (with battery): 2.1 lbs. Makita BL1830 18V LXT Lithium-Ion 3.0Ah Battery. Amp Hour: 3.0 ah. Compatible With: Makita 18V Cordless Tools. Makita DC18RC 18V LXT Lithium-Ion Rapid Optimum Charger. Battery AMP: 2.0 - 5.0. Dimensions: 6.125" x 3.25" x 7.5. Makita-built 4-pole motor delivers 480 in. Variable 2-speed design (0-400 & 0-1,500 RPM) for a wide range of drilling, driving and hammer drilling applications. Compact and ergonomic design at only 8-1/8 long. With battery (battery not included) for reduced operator fatigue. Light with afterglow for enhanced illumination of work area. Rubberized soft grip provides increased comfort on the job. All metal gear construction provides increased durability. Equipped with Star Protection Computer Controls to protect against overloading, over-discharging and over-heating. Only use genuine Makita batteries and chargers. Variable speed (0-2,900 RPM & 0-3,500 IPM) and 1,460 in. Of torque for a wide range of fastening applications. 4-pole motor with innovative 4-brush design delivers increased RPM without decreasing torque. All metal gear housing for increased job site durability. Compact and ergonomic design at only 5-3/8 long. Weighs only 2.8 lbs. Convenient one-touch 1/4 hex chuck for quick bit changes. Light with an independent on/off switch illuminates the work area. Features Extreme Protection Technology (XPT) which is engineered to provide increased dust and water resistance in harsh job site conditions. Makita's proprietary hammer and anvil impact mechanism are manufactured using the best raw materials with the highest quality steel and unique heat hardening process for maximum fastening and driving power. Makita-built motor delivers 3,700 RPM for faster cutting and ripping through wood. Heavy gauge, precision machined base for smooth, accurate cutting and added durability. 50° maximum bevel cutting capacity. Weighs only 7.3 lbs. 6-1/2" blade delivers a 2-1/4" cutting capacity for a wide range of cutting applications. Rubberized soft grip handle provides increased comfort on the job. Makita-built variable speed motor delivers 0-2,800 strokes per minute and a 1-1/4 stroke length for faster cutting. "Tool-less" blade change system allows for faster blade installation and removal for increased productivity. Variable speed trigger for added convenience. Compact and ergonomic design at only 19-1/8 long. Weighs only 8.3 lbs. Large two-finger trigger for operator convenience. Electric brake for maximum productivity. Refined crank mechanism design minimizes blade deflection and reduces vibration. Extreme Protection Technology (XPT) is engineered for improved dust and water resistance for operation in harsh conditions. Automatic Speed Change technology adjusts speed and torque during operation for optimum performance. The BL Brushless Motor eliminates carbon brushes, enabling the BL Motor to run cooler and more efficiently for longer life. Efficient BL Brushless motor is electronically controlled to optimize battery energy use for up to 50% longer run time per charge. The electronically-controlled BL Brushless Motor efficiently uses energy to match torque and RPM to the changing demands of the application. Compact and ergonomic design at only 14-1/4 long. Weighs only 5.6 lbs. Slide switch with lock-on for operator convenience. Gauge indicates battery charge level. Soft start suppresses start-up reaction for smooth start-ups and longer gear life. Variable speed (0-18,000 RPM) for optimum speed control. Up to 12 minutes of continuous operation from a single charge at high speed. Compact and ergonomic design at only 20-3/4 long. Weighs only 3.9 lbs. Rubberized soft grip handle for increased operator comfort. Makita-built variable 3-speed motor produces a maximum air velocity of 179 MPH. A perfect addition to any gangbox or tool box. Equipped with Star Protection Computer ControlsTM to protect against overloading, over-discharging and over-heating. Xenon bulb for 4,500-lux brightness. 4-position head pivots for versatility. Compact and ergonomic design at only 11-1/8 long. Includes shoulder strap and 2 bulbs. An ideal addition to any toolbox or workshop. 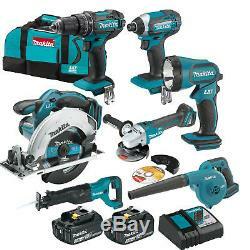 Compatible with all Makita 18V LXT and 18V Compact cordless tools. Battery delivers consistent power and run time in extreme temperatures, even in winter (-4°F/-20°C). Impact-resistant outer case and shock-absorbing inner-liner are engineered to protect the battery. Sixteen contact terminals maintain a constant connection with the tool to help prevent power loss or fluctuation, even during high-vibration applications. Battery resists self-discharge and remains ready for use even after long periods of storage. Makita 18V Lithium-Ion is the world's largest cordless tool line-up powered by an 18V Lithium-Ion slide-style battery. Charges an 18V LXT Lithium-Ion 3.0Ah battery in only 30 minutes. Charges an 18V LXT Lithium-Ion 4.0Ah battery in only 40 minutes. Charges an 18V LXT Lithium-Ion 5.0Ah battery in only 45 minutes. Charges an 18V LXT Lithium-Ion 6.0Ah battery in only 55 minutes. Charges an 18V LXT Compact Lithium-Ion 2.0Ah battery in only 25 minutes. The Makita Rapid Optimum Charger communicates with the battery's built-in chip throughout the charging process to optimize battery life by actively controlling current, voltage and temperature. Built-in fan circulates air through the battery during the charging process to cool the battery for faster charge time. Optimizes battery life by actively controlling current, voltage and temperature. Makita XDT11Z 18V LXT Lithium-Ion Cordless Impact Driver Product Video. Video will open in a new window. Makita XRJ04Z 18V LXT Lithium-Ion Cordless Recipro Saw Product Video. Makita Celebrates 100 Years of Innovation. ALL products listed are under the authorization & permission of the manufacturers who make them. Come in their original packaging (NIB). Tools Plus has been in business for 35+ years and we are dedicated to providing you the highest level of quality service. If you would like us to call you, please send your question along with your name, contact number and the best time to reach you. (Please note: feedback is left once received). An important note regarding Heavy or Bulky items. Destinations "might" necessitate the need for a Lift gate or other additional expenses. These additional expenses are extra cost and you will be contacted for your approval of these extra expenses. You can always ask questions in advance using the Ask a Question feature on this page. Your product's safety and Your Satisfaction is our priority! Images in our listing are indicative of the product and may vary slightly. Accessories are NOT included unless specified in the listing. We don't build anything. So please don't hold against us: color variations nor changes in the products country of origin. Tools Plus sells through numerous outlets, therefore, items may become unavailable unexpectedly. Items that are unused, in the original packaging, and include all accessories and manuals are eligible to receive a Return Merchandise Authorization. Please see your owner's manual for specifics. The item "Makita XT706 18V LXT Lithium-Ion Cordless 7-Pc. Combo Kit (3.0Ah) New" is in sale since Thursday, December 07, 2017. This item is in the category "Home & Garden\Tools\Power Tools\Combination Sets". The seller is "tools-plus-outlet_no_sales_tax_outside_ct" and is located in Prospect, Connecticut.